Being born in Minnesota, it's hard not to be a Hockey Fan. i've been wanting to get this movie! Being born in North Dakota, it is hard not to be a hockey fan too. That's why we loved getting another hockey movie. Okay, the trailer looks great! I've got to look up who the main actor is, I know I've seen him in something. I am a hockey fan. The movie sounds like it would be good. Not hockey fans really, but we are always looking for family friendly movies since we do not watch tv! Thanks for the opportunity to win,, Debra! Cannot call myself a hockey fan since I have never been to a game, but I am really wanting to go see one! 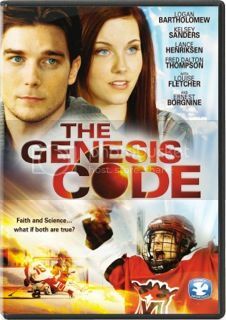 I learned The Genesis Code is one of the best-selling Faith and Spirituality films on Amazon.com! I never heard of it before so this surprises me. My family loves movies & movie night! No hockey fans here, but I adore movies that use sports as a backdrop in them. And, I'm really curious to see this one after reading a few reviews.